Apple Picking at Wasem Fruit Farm! Ruby and I went apple picking at Wasem fruit farm with a group of my friends this afternoon. She seemed to enjoy herself, and I got to come home with a big bag of apples! I brought my Nikon camera with me since I don’t take enough pictures. It was really sunny all afternoon, so I used a UV filter to take these photos. Note that you can click each picture to see larger versions. Checking out the pumpkins at the front! Row upon row of apple trees. In addition to apple picking, they also had pick-your-own raspberries. Cheddar is the most time-consuming cheese that I’ve made so far. I’ve made two now, and both times required about 9 hours of work before I could let it sit in the press. What sets Cheddar apart from other cheeses is the “cheddaring” process, which pushes out as much whey as possible out of the cheese curd. This process makes for a very firm, dry (hard) cheese. Here is how it works: formed cheese curds are cut into “slabs” and layered on the bottom of the pot. The slabs are flipped every 15 minutes to push as much whey as possible out of the bottom of the stack. After 90 minutes, the stacks are milled into 1/2 inch cubes and heated again to push out even more whey. Cheddar “slabs” stacked, but not criss-crossed. Slabs are stacked on top of each other, doubling their height. They are flipped over every 15 minutes for the next 90 minutes. The layers knit together as they are cooked and flipped. At this point the cheese curds are very firm and rubbery, and must be pressed for about 36 hours to remove more whey and so the cubes can merge together. The exterior of the cheese was bumpy, which I’m not used to seeing. I’ve decided not to worry, since the interior was fairly smooth and solid. Cheddar needs to age for at least three months, so I won’t know how it really turned out until the beginning of December. Cheddar cheese curds before pressing. Cheese under 40 pounds of pressure. The weight pushes whey out of the cheese, making the final cheese both dryer and firmer. Cheddar cheese that has been air dried for about 24 hours. 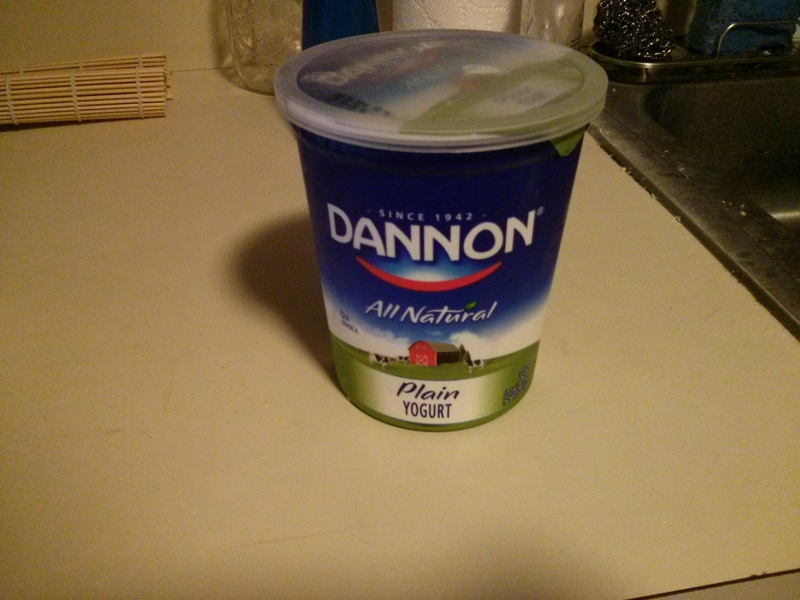 Start with one quart of plain yogurt. I assume that a flavored yogurt will result in flavored cream cheese, but I haven’t tried it. Yogurt to turn into cream cheese. 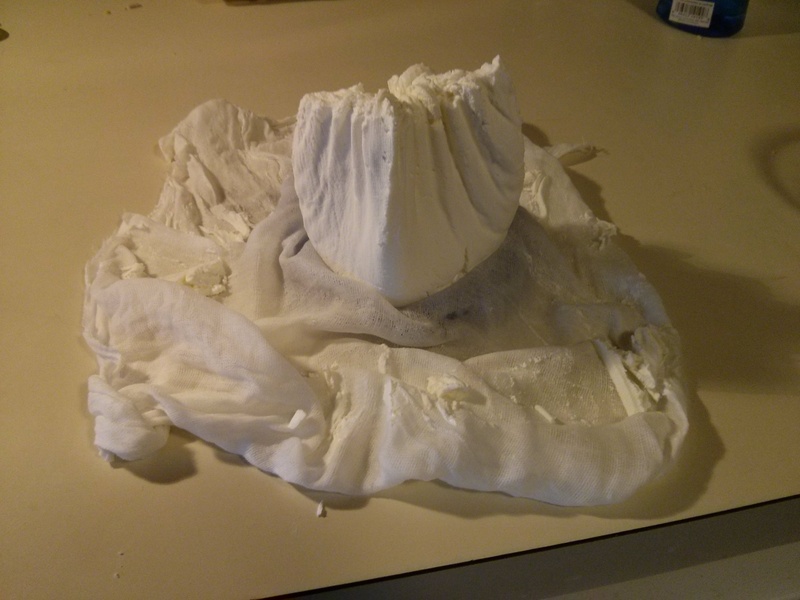 Pour the yogurt into clean cheesecloth or a linen towel. I put mine into a pot of boiling water first, to kill off any extra bacteria. 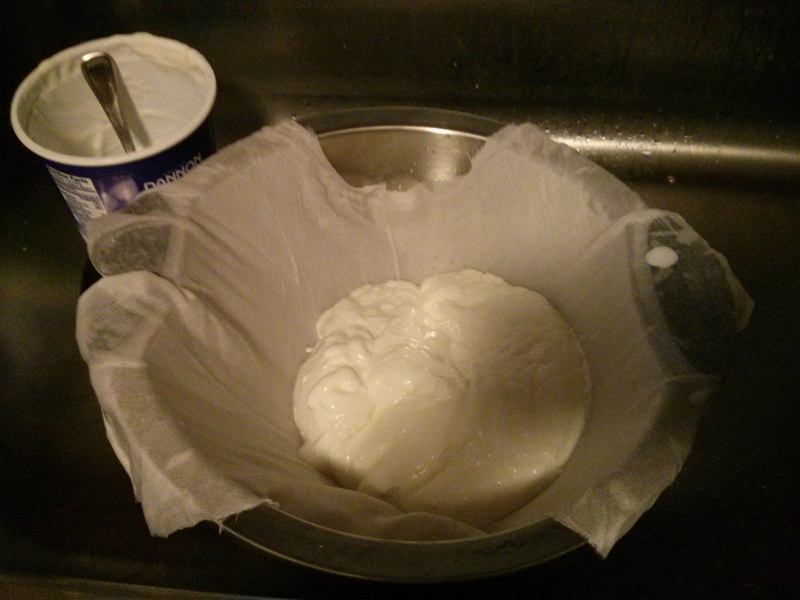 Yogurt poured into sterile cheesecloth. Hang the cheesecloth somewhere to drain at room temperature for about 12 hours. 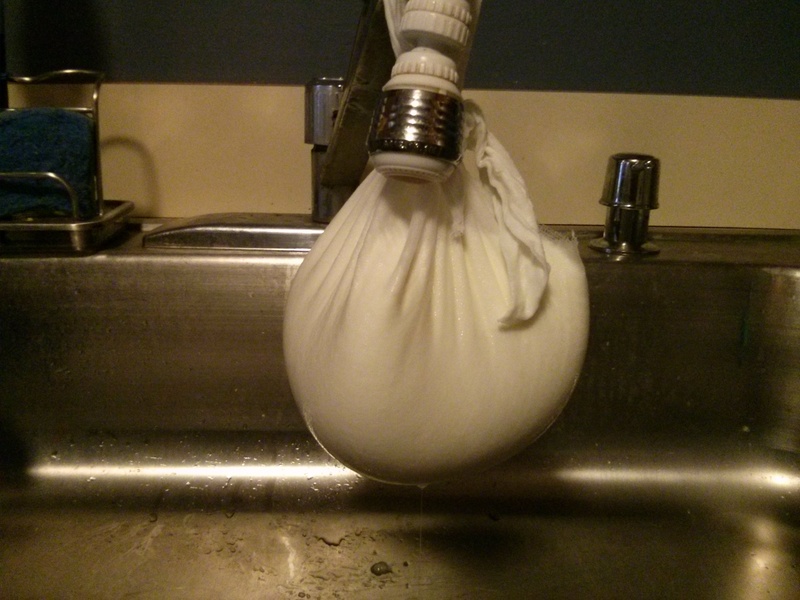 Cheesecloth tied into a bag and hung over a sink to drain. Unwrap and enjoy your cream cheese! I had a new floor installed in my home to give me a chance to fix some water damage I had noticed (I’m pretty sure that’s how the chipmunk got in!). I needed to pull up the carpet in the dining room to patch the hole, and I decided to put down laminate flooring since carpet is a really good crumb trap. The install went well – I was completely floored by it! :P. Photos are in the slideshow below. I want to make cheese for all of my friends. This is part two in my attempt to accommodate my friends who can’t eat dairy products. 4 cups of cashews for vegan cheddar. Vegan cheddar begins the same way as vegan yogurt: lots of cashews! I blended everything together and heated the resulting “cashew goo” on my stove. This mixture was then poured into my cheese press to give it shape. Finally, the cheese was air-dried for a few days. Vegan cheese that has been air dried for about three days. 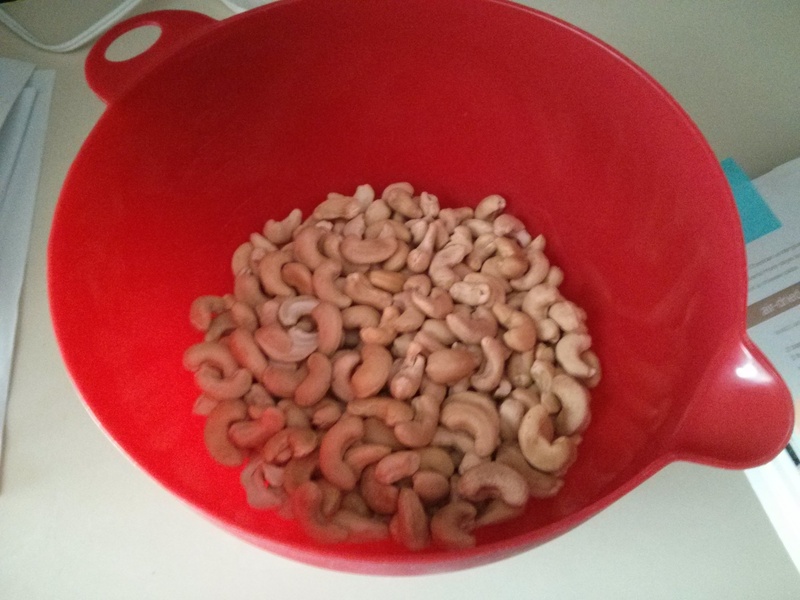 I doubled the recipe from the book, and I don’t think all the cashews were ground up in the second round of blending. 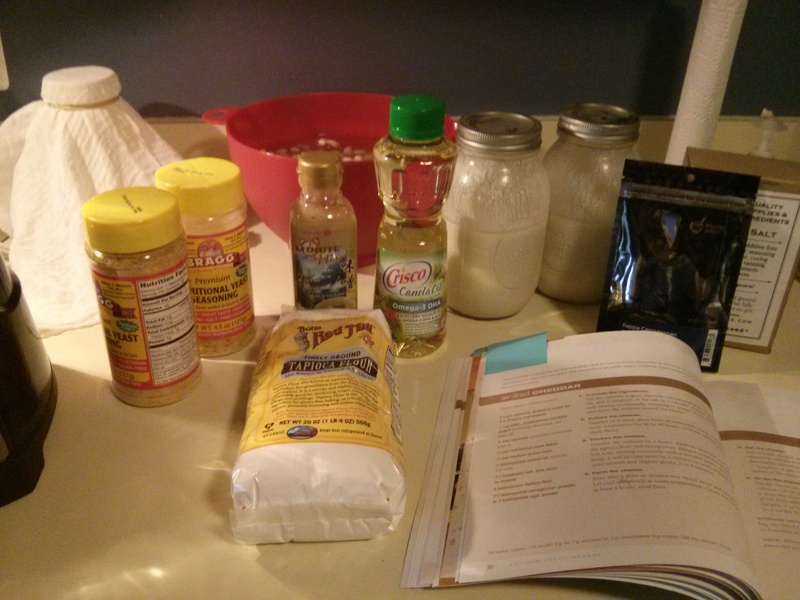 Next time: I won’t double the recipe. The yogurt I used was thinner than I was expecting (see Part 1). Next time: I’ll either buy soy yogurt from the store or spend more time focusing on the cashew yogurt so it thickens a bit more. I noticed that I cooked some of the cheese to the bottom of my pot while heating. Next time: I’ll use a double boiler setup to distribute heat more evenly. I only “pressed” the cheese on one side, leading to one smooth side and one rough side. Next time: I want to press for a few minutes on both sides.